I studied in Florence ten years ago, and still parlo a bit of the italiano (although not as well these days as I would desire) and I love being called a “ragazza americana” once again. Right On! you’re International chic! i discovered your blog after reading wired. 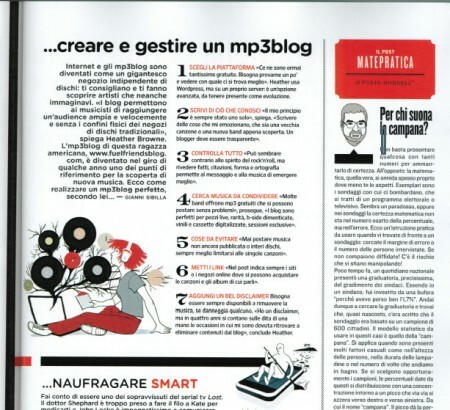 Same as Matteo, Ale and Maurizio i discovered your blog on Wired-IT. Nick Hornby turned me onto your blog but now I like it even more! Ciao! Very good!! !… ’cause this is simply the best music blog in the net! Ciao “ragazza americana”! The page from Wired magazine was were I came to know about you! Now I’ll try to surf your place to know something more about you and your cool idea! Wow..and if i call you “bella bimba”? A big CIAO from Florence. During my study time in Italy i have tried to learn complete Italian Language with full fluency but it was pretty difficult experience for me although i could understand the things.